For the first time in franchise history, the Nashville Predators failed to make the NEFHL playoffs. This article will look back at the 2007-2008 season and try to provide some perspective on why this year's club failed, and where the team is headed in the future. Reeling from a 1st round playoff exit to the impending Cup champion Dallas Stars, in which they were swept and only managed to score 2 goals in 4 games, GM Mathieu Morin knew that some things needed to change in Nashville. Lets start this review at the 2007 Entry Draft. The Predators had no pick until the 3rd round, where they selected Nick Spaling (left) at #71. They had two other picks in the 3rd round, selecting Taylor Ellington at #76 and Blake Kessel at #90 to close out the round. Three more picks were made in later rounds. However, 2007 was very much like 2006, years in which farm depth was sacrificed for on-ice success. The Predators hope that a diamond-in-the-rough will come out of the picks but they aren't expecting much. Heading into free agency, the Predators had 3-4 million in free cap room and looked to make a splash by landing a 2nd line forward. However, that would not prove to be enough as they found themselves outbid at every opportunity by teams with even more cap room. They initially went hard after Michael Nylander (right) and Glen Murray who ended up in Calgary and Ottawa. Radek Dvorak and Shean Donovan both chose rival Detroit over the Preds. Even restricted free agent Jan Bulis wouldn't sign, turning down an offer of 1.5 million to play with the club. In the end, the Predators were able to snag a couple of players that had been off the radar. Ben Guite signed a 1-year deal to compete for a 4th line spot on the team and Jason Strudwick also signed a 1-year deal to compete for the 6th defenseman spot. Not the splash the Predators had hoped to make, but useful signings nonetheless. Then, on August 22nd, GM Mathieu Morin swung two deals, one of which would drastically alter the face of the team. A couple of days prior, Morin had been approached by the GM of the Capitals, who was shopping either Iginla or Kariya, or both. 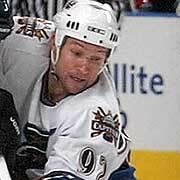 Over the course of a few days, negotiations were held, first for Kariya, then for both stars. In the end, a deal was finalized to send Souray, Horcoff and Blake to Washington for Paul Kariya (left), Jarome Iginla and a 3rd rounder in 08. The Predators sacrificed some depth on the defense for the franchise forward they had always been lacking in Jarome Iginla. The deal was met with shock and awe from the league as the Predators came out of nowhere with the biggest deal in the team's history. In a smaller, but in hindsight very important deal, on the same day, the Predators shipped prospect Drew Larman to the New Jersey Devils for C Derek Armstrong. Known for his passing ability, Armstrong provided a solid upgrade to Bates and MacLean at center. As the preseason started to wind down, Predators management realized that they were faced with a tight squeeze in terms of salary under the cap and as a result, they were forced into a salary cutting move, in which they sent underperforming forward Mark Parrish to the Blue Jackets for defensive forward Sergei Brylin. Shortly thereafter, the Predators saw an opportunity to pick up an upgrade on the 4th line for next to nothing and scooped Ben Clymer out of Buffalo for some cash. Unfortunately, somewhere between the preseason and the regular season, the team lost its way. The Predators opened the season to a 7-12-3 record through its first 22 games, in which they were outscored 61 to 78. During this stretch, Pavol Demitra was lost to a serious injury for what would be over a month. Mike Fisher was asked to shoulder the load at centre, something which he did not adapt to. Derek Armstrong picked up a lot of the slack, scoring well above what the general public expected from him. On November 26th, 2007, head coach Craig MacTavish was fired and replaced by Tom Renney (right). It was clear that MacTavish's offence first system wasn't working and that the Predators needed some defensive accountability. The Predators responded well, winning 5 of their next 6 to return to one game below .500 and Jarome Iginla appeared to rediscover his scoring touch. However, the rejuvination would not last long. By the time the year 2007 was over, the Predators were sitting 15-20-3, outside of the playoff race. At this point, it was clear to Predators management that a major shakeup was needed in Nashville and that it may be too late to rescue the season at hand. Two of the biggest culprits were Mike Fisher and Jere Lehtinen, who were both seriously underpeforming based on their ice time. In a late November issue of the popular Thumbs Up, Thumbs Down, both Fisher and the Predators were singled out by GM's - Fisher for his poor play and the Predators for their inability to win key games. Immediately, GM Mathieu Morin placed both players on the trading block and soon found a trading partner in the Tampa Bay Lightning, who were looking for an early playoff boost. Recognizing the need to go forward and the shallow prospect pool, the Predators dealt Fisher, Lehtinen and Garon to the Lightning for goalie Pascal Leclaire (left), forward Patrick Sharp and a 2nd round pick in 08. Leclaire and Sharp are 25 and 26 years old respectively and enjoying breakout seasons. The move was a sign that the Predators are committed to a sustainable future and are no longer in the business of sacrificing depth for current success. 2008 did not prove to be a much better half of a season for the Predators but now that the focus on winning had been removed, the air in Nashville seemed a little lighter. In early February, management placed all the impending free agents on the trading block and on February 11th, defenseman Jason Smith was dealt to the division rival Blue Jackets for prospect Tim Ramholt and a 3rd round pick in 08. Oddly, the departure of Smith seemed to put some wind in Nashville's sails as they started to climb up the standings prior to the deadline, putting themselves at 27-31-7, only a few points out of 8th. GM Mathieu Morin decided that if he could add to the club without removing the future, he would in an effort to give his team a shot at the playoffs. In the end, the Predators fell short, finishing with a final record of 33-40-9, good for 11th in the West and 4th in the Central Division. More importantly, the Predators believe that they are in excellent shape for next season. Over the course of the season, the Predators amassed a number of draft picks and now count a 1st, 3 2nds, 3 3rds and a 4th for this summer's Entry Draft. A number of players are expected to graduate to the pro squad next year including Mason Raymond and Brooks Laich. Jarome Iginla was the team's offensive leader, leading the squad in goals (37), assists (39) and points (76). Shane Doan posted a respectable season including 35 goals, 17 of them on the power play. Dan Boyle led the team's defencemen in points with 50. A number of players will become unrestricted free agents this summer and will be coming off the books. Among them are Armstrong, McKee, Smolinski, Kilger, Martinek, Bates, and Strudwick. The money that is freed up from this should allow the Predators to be significant players in the free agent market. Kariya is also unrestricted this summer, however, he is expected to be retained by the Predators. The future is bright in Nashville, and anything less than a return to the playoffs will be a disappointment in the Music City worthy of a country music hit. Since GM Mathieu Morin is not a country music fan, he will be trying very hard to make sure that doesn't happen.